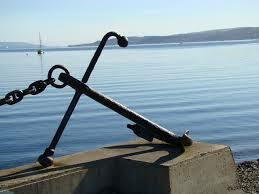 The author of this hymn, "Will Your Anchor Hold", is Priscilla Owens. She was born in Baltimore , USA in 1829 of Scottish and Welsh blood. For over 50 years Priscilla Owens was actively involved in work for Christian youths and most of her songs were therefore composed for children. Besides this hymn she is also well known as the composer of another beloved christian hymn, "We have heard a joyful sound". She also composed several other hymns during her fruitful life on earth. "Will Your Anchor Hold" was sung outside the door of the dying hymn writer Mary Fawler Maude (Thine For Ever! God of love). She sent her singers the message, "Tell them that it does not fail - it holds." The hymn suggests that personal stability can only come from the right foundations. It employs a sea faring analogy in making its point.